From this short tip you will learn how to quickly sort cells by background and font color in Excel 2016, Excel 2013 and Excel 2010 worksheets. Last week we explored different ways to count and sum cells by color in Excel. If you've had a chance to read that article, you may wonder why we neglected to show how to filter and sort cells by color. The reason is that sorting by color in Excel requires a bit different technique, and this is exactly what we are doing to do right now. Sorting Excel cells by colour is the easiest task compared to counting, summing and even filtering. Neither VBA code nor formulas are needed. 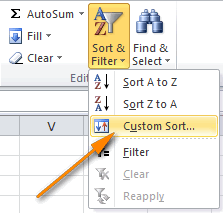 We are simply going to use the Custom Sort feature available in all modern versions of Excel 2016, 2013, 2010 and 2007. Select your table or a range of cells. In the Sort dialog window, specify the following settings from left to right. Click the Copy Level button to add one more level with the same settings as the first one. Then, under Order, select the color second in priority. In the same way add as many levels as many different colors are in your table. Click OK and verify if your rows have got sorted by color correctly. In our table, the "Past Due" orders are on top, then come "Due in" rows, and finally the "Delivered" orders, exactly as we wanted them. Tip: If your cells are colored with many different colors, it is not necessary to create a formatting rule for each and every one of them. You can create rules only for those colors that really matter for you, e.g. "Past due" items in our example and leave all other rows in the current order. If sorting cells by only one color is what you are looking for, then there's even a quicker way. Simply click on the AutoFilter arrow next to the column heading you want to sort by, choose Sort by color from the drop down menu, and then select the color of cells that you want to be on top or at the bottom. BTW, you can also access the "Custom Sort" dialog from here, as you can see in the right hand part of the screenshot below. In fact, sorting by font colour in Excel is absolutely the same as sorting by background color. You use the Custom Sort feature again (Home > Sort & Filter > Custom Sort…), but this time choose Font Color under "Sort on", as shown in the screenshot below. Apart from arranging your cells by background colour and font color, there may a few more scenarios when sorting by color comes in very handy. 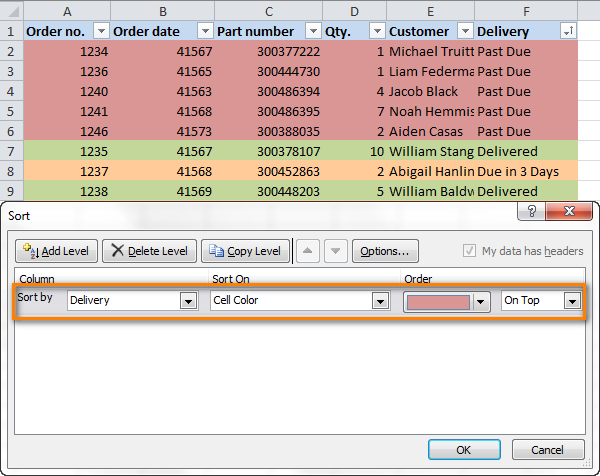 For example, we can apply conditional formatting icons based on the number in the Qty. column, as shown in the screenshot below. As you see, big orders with quantity more than 6 are labeled with red icons, medium size orders have yellow icons and small orders have green icons. 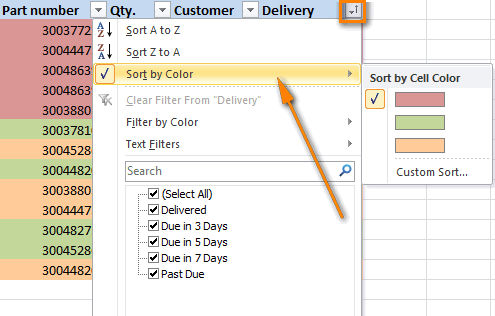 If you want the most important orders to be on top of the list, use the Custom Sort feature in the same way as described earlier and choose to sort by Cell Icon. It is enough to specify the order of two icons out of 3, and all the rows with green icons will get moved to the bottom of the table anyway. 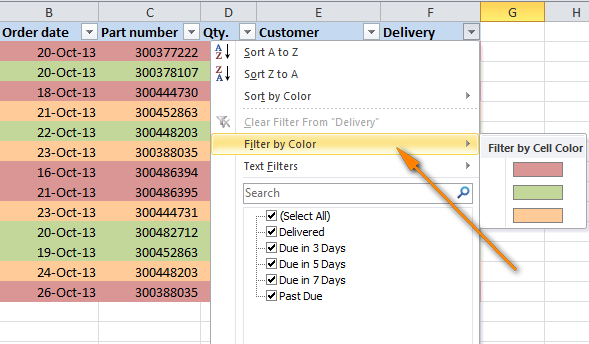 If you want to filter the rows in your worksheet by colors in a particular column, you can use the Filter by Color option available in Excel 2010, Excel 2013, and Excel 2016. Create an additional column at the end of the table or next to the column that you want to filter by, let's name it "Filter by color". 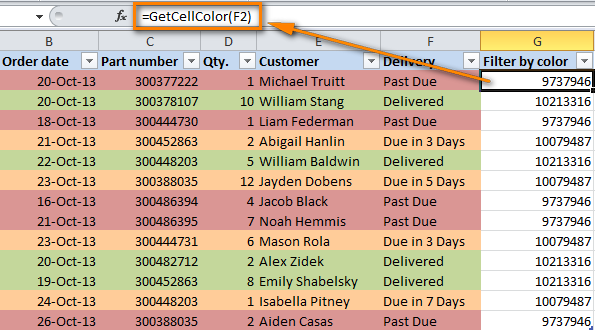 Enter the formula =GetCellColor(F2) in cell 2 of the newly added "Filter by color" column, where F is the column congaing your colored cells that you want to filter by. Copy the formula across the entire "Filter by color" column. 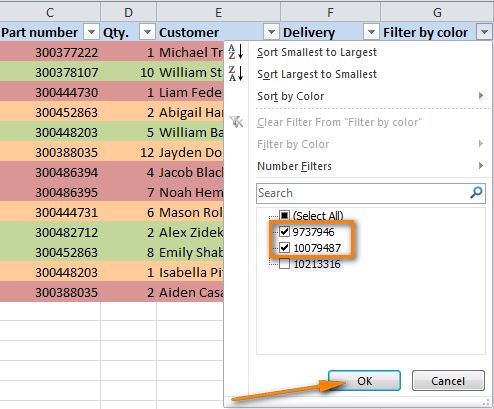 Apply Excel's AutoFilter in the usual way and then select the needed colors in the drop-down list. As a result, you will get the following table that displays only the rows with the two colors that you selected in the "Filter by color" column. And this seems to be all for today, thank you for reading! Most likely this is going to be my last article in this year, so let me take a moment and wish you Merry Christmas and a very Happy New Year. We will be delighted to welcome you again here on this blog in the year of 2014! 40 Responses to "How to filter and sort by cell color, font color and icon in Excel"
Thank you very much for your kind feedback, Joe! I want to use exactly this but I would like Excel to sort automatically as the cell color changes. When the cell is Paid conditional formatting is set to fill grey the entire cell row.I would also like the Greyed items to automatically go to the bottom of the list? Regrettably, this cannot be done using Excel formulas, a VBA macro is needed. Hope this might helpful for your request. First conditionally format the row to be grey once the cell value is equal to grey. Then apply a custom sort to get the grey colored cell to bring down to the bottom of the data using custom sort function. You may need to click on the sort reapply button to make this happen after each new entry. Let me know if you need help on this. This was incredibly useful. Good job putting these intructions together. Is there a possibility that we can sort two different colors in a single cell. e.g. First Name and Last Name are copied in a single cell, however, in different colors. Is there a way of sorting them? I hope, I made myself clear! The easiest way is to convert your data to an Excel table (select it and press Ctrl+T or click the Insert tab > Table). Then, simply click the Filter drop-down arrow in the Name column's header, choose Sort by Color and select the color you want to sort by. If you want to add sorting by a second color, then click Sort by Color > Custom Sort... > Copy Level and choose the second color. For some reason I have a spreadsheet and on some columns i can sort by color than that option is frozen when trying to select other columns. All columns have at least some color in them. Any thoughts? WHen i enter the Getcellcolor formula it does not work. am i missing something? I have not any formula like that? where can I find or add this formula? Why do only some of the greens go to the top when I sort by color? How do I fix this? It seems like the ones using conditional formatting don't sort. my excel worksheet cell have colors in it, not in all. But the problem is i cannot see the cell color when try to sort by color. Why? We have data in a spreadsheet that has been subtotaled. There are certain lines that we want to look at and have changed the cell color for that data. But now we can't seem to sort by the cell color. Is that because the data is already subtotaled? I appreciate the effort put into explaining the features present in Excel. On the drop down menu at the top of the column the "sort by..." feature does not come up, just "custom sort". How do I get color sort back? Please check that there are cells with more than one font or fill color in the selected column. After I select "font color" under the "Sort On" column I attempt to select a color under "Order" but the only option available to select is "Automatic". Any idea what I am doing incorrectly? Perhaps, there are no cells with another font color except Automatic in the column you select for sorting. Wow thank you for this. I have multiple cell colors and you just made my life so much easier. for ex: if I entered 12,13,14 number in column B and in the C column I entered 12, and 13 only then I will coloring the cell using conditional format (Duplicate value) then the remain is 14 that 14 only should come to the Pivot table?? Hello, I am wanting to pull data by color. 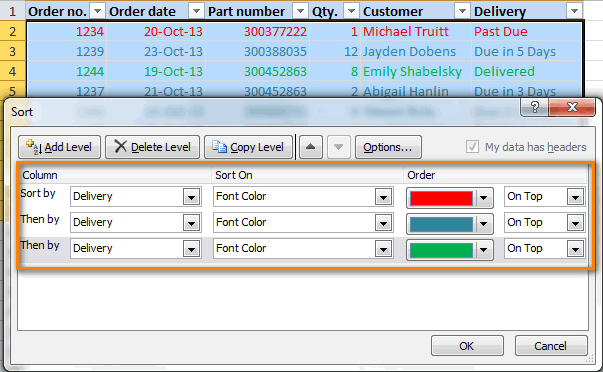 For example, if column A is made up of blank cells that are green, but when a date is added to the cell we turn it orange until the item is returned then the date is turned green again. Can you get it to pull the number of orange cells in Column A? Secondly, can you get it to pull the number of green cells with data entered? How To Extract cell values based On cell Color for example in a 3×3 matrix(1st coloumn 1st cell and 3rd coloumn 2nd cell are filled with blue and the rest is filled with yellow), in this case lusting only the cell values filled with blue colour and listing this separately in the same excel? Hello, can I filter the whole sheet by color? I have an spread sheet with a lot of data, but when i completed my items, I just want to see just what I mark on color. Not getting option sort by colour on Microsoft Excel mobile app.....Pls.help..